The Nokia X5, which was released globally as the Plus version of the Nokia 5.1, although it oddly comes with a lower raw main camera resolution (We'll examine its photography specs as we go along this technical review), is a wide-screen smartphone that's tailored to users who don't want to reach to a full-blown flagship smartphone just yet. 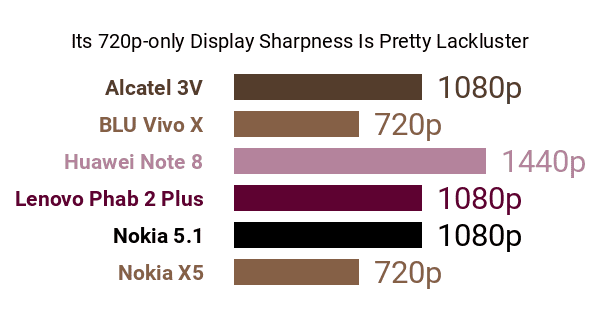 Like many other middle-class phablets, the X5 opts for a rather mellow 720p screen resolution (1520 x 720, to be exact), but its 5.86-inch facade does boast an expansive 19:9 aspect ratio that reminds us of some solid upmarket wide-screen contenders. Some users might consider its 8-megapixel f/2.2 front-facing camera a slight con as well, seeing that a few other mid-range contenders featured here at Phonerated offer 13-megapixel selfie shooters. That being said, it does feature AI imaging technologies and an integrated background blurring function for portrait shots , which are welcome pros in this market segment. As for its main camera, the X5 makes up for its forenamed reduction in camera resolution (The 5.1 features a 16-megapixel camera) by combining its 13-megapixel main cam with a 5-megapixel depth-sensing deputy camera , ergo, adapting the dual-lens camera setup that was popular among upscale photography-focused smartphones when it debuted. Also part of its assortment of pros and cons is a MediaTek Helio P60 dual-cluster processor that sounds more promising versus those of some of its eight-core contemporaries, since both its clusters run at 2GHz -- dual-cluster chips usually have a high-speed performance engine and a low-speed one for undemanding applications. It is accompanied by either 4GB or 3GB of RAM , while a 64GB/32GB memory that can be expanded by a maximum of 256GB is on storage duties. The X5 is powered by a 3060mAh battery, which, by 2018 mid-level standards, sounds just about right. The typical VoLTE call audio enhancement technology and the Android 8.1 Oreo operating system join in as well. Housing the Nokia X5's pros and cons is the combination of a double-sided glass body , a polycarbonate frame, and a design concept that conceals the phone's antenna for a cleaner finish. It is coated in either Glacier White, Night Black, and Baltic Sea Blue. In summary, the Nokia X5 is a model that's geared towards shoppers who are looking for a large-screen, dual-cam-rigged mid-end smartphone.